You can take your call log with you on the road using PhoneLog for iPhone & iPad. It has many of the features from PhoneLog Pro and you can sync your call logs between the iPhone or Pad version and PhoneLog Pro on the Mac using your Dropbox account (even free accounts). Click on the each of the features on the right for more information. Press the timer to record duration and end time while you're on the call. Retrieve contact details from the address book without having to type them in again. Add events to your calendar to record when you made a call and set reminders for follow up calls in the future. Assign statuses like "Follow-up" or "Waiting Reply" to calls and quickly filter the call list to show only matching ones. PhoneLog automatically saves changes as you work and keeps multiple backups. You can view these backups later and revert back to an old version. 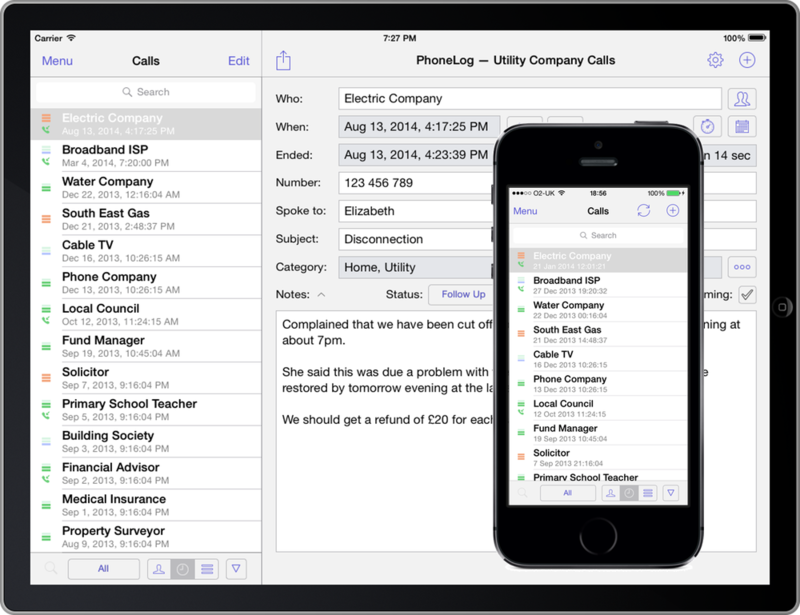 Sync your call logs between multiple iPhones, iPads and with Macs that have PhoneLog Pro. A Dropox account may be required for this.